Reference for others wishing to hold a 100 inning	game. 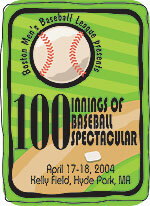 The Boston Men's Baseball League teamed	up with Curt Schilling and The ALS Association, Massachusetts Chapter by holding what is believed to be the longest baseball game	ever played in New England -- 100 innings -- though the game actually went 101 innings. 183 players ultimately suited up and played in the record-breaking game to raise	money for Lou Gehrig's disease at Kelly Field in Hyde Park. The game began Saturday 4/17 at 9:00AM and concluded	Sunday 4/18 at 6:00PM -- 33 straight hours, nonstop through the night. About $99,035 was donated in cash, check and credit card, with $111,949 raised overall. More than 1,615 different sponsors provided pledges to these ballplayers. 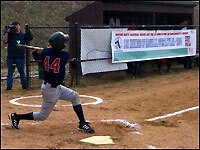 Ballplayers	were primarily from the BMBL, but also came from New Hampshire, Rhode Island, Maine	and even Canada to play. By raising donations, players earned contributions toward their league fees, as well	as prizes, such as signed Red Sox jerseys, invitations to a private party held by	Curt Schilling, Reebok cleats, Donruss baseball cards, Red Sox Green Monster seats,	and much more. Corporate sponsors donated food and drink, and included Stop &	Shop, Red Bull and cafenation. Hundreds of other corporate and personal sponsors	have made financial contributions. Curt Schilling of the Boston Red Sox' wife Shonda was in attendance on Sunday. Shonda	went 1 for 1 with a single up the middle, scoring the 95th run in the bottom of the	93rd inning for Team Stamina. Curt Schilling was unable to attend, as the Red Sox	were battling the Yankees all weekend. The "Official Check Ceremony" took place April	29th before a game on the field at Fenway Park in the near future - details to come. Those who wish to contribute can can still make a donation.